A Mongolian Beef And Broccoli better than take-out? YES! It IS possible. 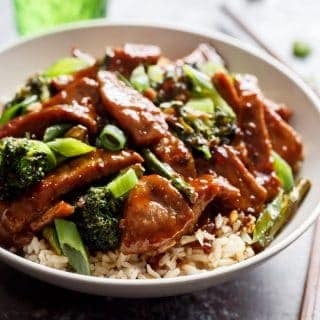 With an added ingredient to make this thick and glossy sauce taste even BETTER than take-out, PLUS extra sauce in the recipe, the beef is tender/soft using less than half the oil than other recipes. 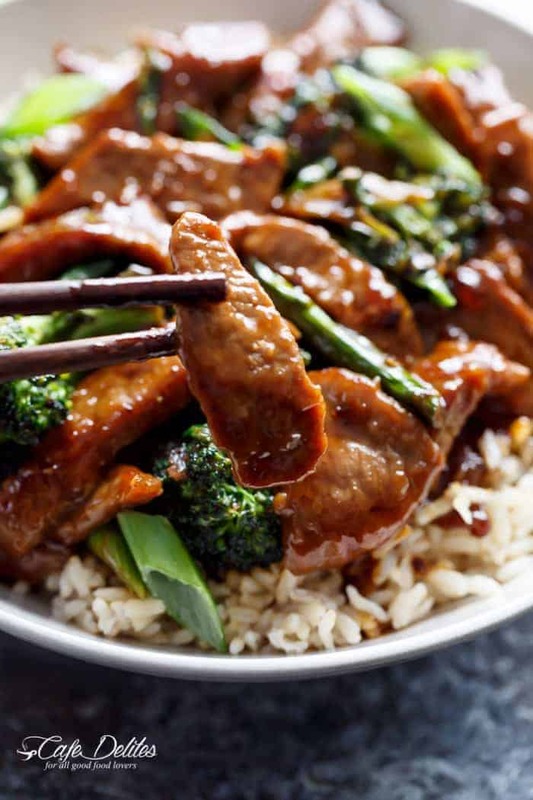 Most Mongolian Beef recipes do not have the addition of vegetables and call for deep frying the beef in 1 cup or more of oil. But not this one. I tried many ways to reduce the calorie content in this recipe. I’m hoping you can see how soft, silky and smooth that beef really is. 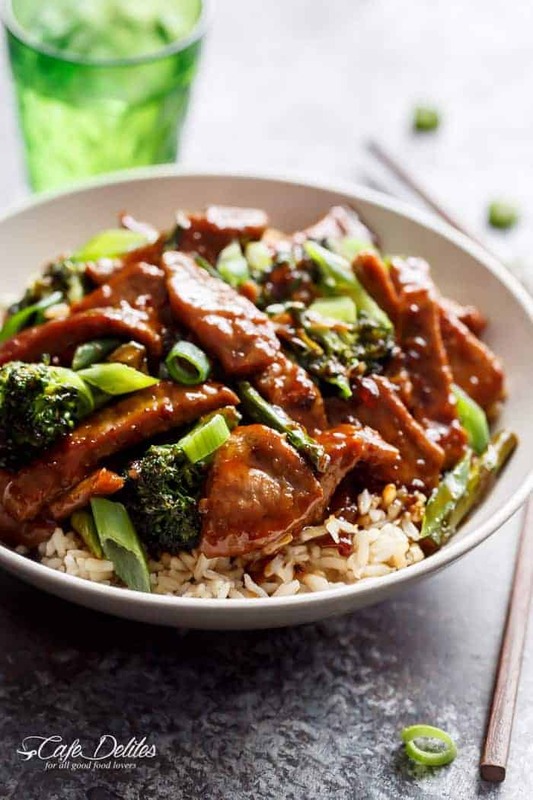 Plus, the addition of broccoli turns Mongolian Beef into an incredible family loved stir-fry! The most important step in this recipe is to marinade the beef in a mixture of cornstarch and vinegar. 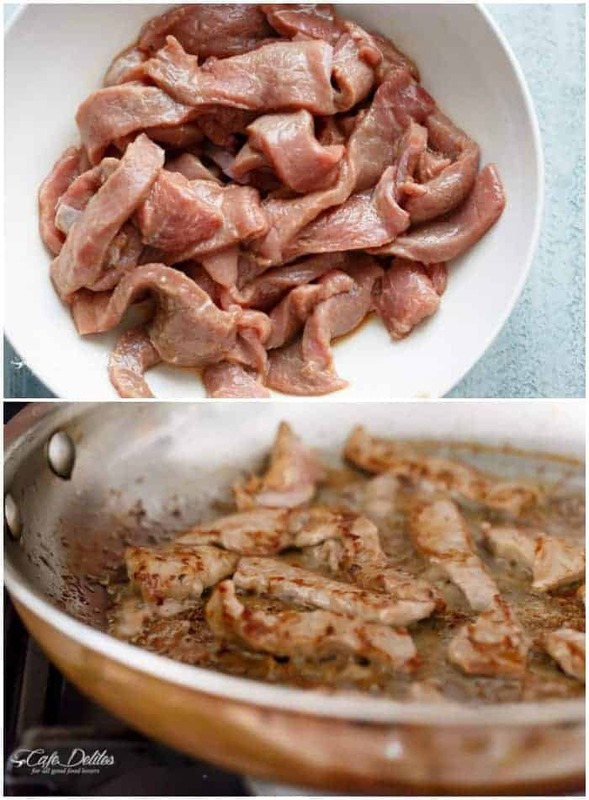 The technique that most Chinese restaurants use to create that tenderised texture we love so much is called velveting. It feels like a secret to Chinese cooking. Well, not anymore. Velveting can be made up of a mixture of egg whites, baking soda and wine, but in this case, we’re using cornstarch, rice wine vinegar and soy sauce. After the meat is marinated, it is then — most traditionally — blanched in deep fried oil, then drained and ready to be stir fried. Well, as usual, I broke tradition to make this recipe easier for those of us home-cooks that aren’t comfortable with deep frying → not wanting to start any fires → not wanting to think of the fat pants needed afterwards. We only needed 1/4 cup of oil for 2 pounds (1 kilo) of beef strips, and found that was plenty, without needing to drain any oil afterwards or worry about where I was going to put any leftovers. The method works, don’t let it scare you. And only half the fat pants needed. My biggest piece of advice is to have your oil hot before adding the meat. DO NOT have your oil on high heat, or it will spit and spatter all over you and your stove top. Just…..trust me. Medium heat is enough. If your oil is preheated and hot, your meat will cook FAST. Stir frying it for about 2 minutes is enough time, until you see crispy, golden edges. Adding Hoisin sauce into tho sauce? Priceless. A delicious addition and adds an incredible flavour. Beautiful, soft Mongolian Beef. At first glance, who can be bothered with that extra step, but believe me, if you want Chinese restaurant quality beef, go the extra step and do it. LOVE ASIAN INSPIRED RECIPES? TRY THESE! 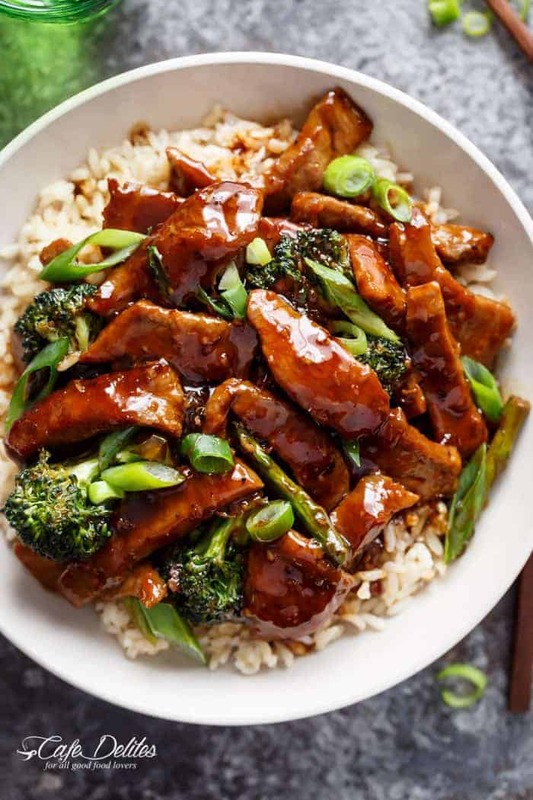 A Mongolian Beef And Broccoli like traditional take-out? With only HALF the oil needed compared to other recipes, this Mongolian Beef is even better! Whisk marinade ingredients together until well combined. Marinate the beef slices for 30 minutes to an hour (The more marinading, the more tender the meat will be). While beef is marinating, whisk together the sauce ingredients until well combined. Set aside and prepare vegetables. Heat up a wok over medium heat with the 1/4 cup of oil. When oil is hot, stir-fry the marinated beef in batches of four (don't crowd the wok) until they are just crisp on the edges (about 2 minutes. They cook FAST in the hot oil. Don't have the oil on high heat or it will spit and spatter all over you and your stove). Remove the meat, leaving as much oil in the wok, and set aside. Heat up the sesame oil in the wok with any remaining oil, and stir-fry the garlic and ginger until fragrant. Add the vegetables and stir fry until they are vibrant in colour and just tender. Add the beef back into the wok with the prepared sauce. Simmer in the sauce until the beef slices are cooked through (about 2 minutes); add the con starch mixture and the sliced green onions. Cook for a further minute or until the sauce thickens, wile stirring quickly. Garnish with extra green onion slices and serve immediately over rice or steamed vegetables. *I used normal soy sauce in the beef marinade, BUT found low sodium soy sauce tasted A LOT better for the sauce. We found normal soy in the sauce was too salty. **If you can't find Shaoxing wine, use a Rice Wine Vinegar; White or Apple Cider Vinegar instead. This was simply delicious! I had bought round steak by mistake and used it – cut it across the grain, seared it to a little crispy edge, followed the recipe (other than increasing the ginger a bit, and using dark soy and regular soy – just ran out. Fabulous ! it did splatter but worth it for the delicious meal. Great! I’ve been making beef with broccoli for a long time using different recipes and I think this one is it. The only changes I made (because of what I had) were; white wine in the marinade and a Szechuan sauce in place of the hoisin which gave it just the right amount of spice. This looks delicious, I want to try this recipe but not sure if I can find beef tenderloin and not break the bank:). Is there another cut of beef I could use? I appreciate your time! You can also use a flank steak. The recipe is spot on. I did however make some changes, I sub 1 tbs of Chinese cooking wine with 1/2 tbs of lemon juice and 1/2 tbs of rice vinger. The non-alcoholic substitute. I am in muslim country and they dont have cooking wine readily available. I also used rice flour to mix in the marinade. (I didnt have any cornstarch on hand.) I went to the store and bought corn flour to be used for thickening sauce. It was soo delicious and flavorful, thank you! This was pretty delicious! Had my own little twist and added a tbs of gochujang and some brussel sprouts in the mix. Topped with cilantro and cashew crumbs. Mmmm Mmm! I live in Greece, where Steak is expensive & tasteless as they don’t hang meat to mature here. Could I use chicken breast instead? Do you think it would taste good? You are welcome to try with the chicken. I am not sure if the sauce and chicken coordinate together but it is always worth a try. Hope you enjoy it! Let me know what you think! Should that be 4 tsp, instead of tablespoons, of minced garlic? Conversion on jar says 1 clove = 1/2 tsp. Thanks! Hello! This looks delicious! I would love to make it for my son’s birthday but because I will be bringing it to his home is there any way I can make it a little ahead of time? Thank you for your response! This sounds amazing! I *always* order beef and broccoli when I eat Chinese. So happy to know how to make it at home now! is the chili powder cayenne pepper or chili powder blend? Good recipe, I will definitely make it again. The only change I will make is to reduce the white pepper, it made the dish linger on the tongue with a bit of spice. Normally we love that but the baby was eating too and I think it was too much for him. Great recipe though. Oh goodness this was good. My pickiest eater had THIRDS. You don’t even know how unheard this is. Seriously. I used coconut oil to stir fry and unfortunately that did spit and splatter all over but I survived and wow it was all good. This recipe was absolutely amazing! !! What a hit with my family…my son actually asked me if I ordered in the beef! Whoohoo nailed it! Thank you so much! ! It’s a keeper! Can’t wait to make it again??? Hi can we use white vinegar instead of rice wine vinegar??? I made this as soon as your email came through and WOW! Karina you’ve out done yourself. This recipe is a winner for chinese dinner. Thank you for all of your work and amazing recipes. Your hard work shines through every recipe. I love following you. And the fire story made my day! Thank you for giving me a laugh. Now to attempt your cookie sticks! Haha Jackie thank you! It’s so nice to feel appreciated. YOU’VE made my day now!!! I hope you like the cookie sticks! This looks amazing! I too would like to see the nutrition information. Love your work! I enjoy hearing how you arrive at the final recipe (including the fire stories!). Lol my fire situation is on point that’s for sure! Thanks Wendy! I love your recipes! They are awesome! Why don’t you include the nutrition facts anymore? Hi Brandy! I found they were conflicting with some readers unfortunately. If I have a lot of requests to continue them again I definitely will! I used eye fillet cut for this recipe followed it step by step and it was simply amazing . Thank you so much for the effort you go through to give your followers an amazing accurate easy to follow recipe . So many more I need to try on your page ❤️???? Oh wow, this looks amazing, I have saved to try. Thank you for sharing.